Here are some more pictures, this time from my POV! Josh, Jay and show Zev and JF from Filosofia/Z-man the reworked “Rock, Paper, Wizards” game. After getting some great feedback from them, it was back to the lab to tweak things here and there. 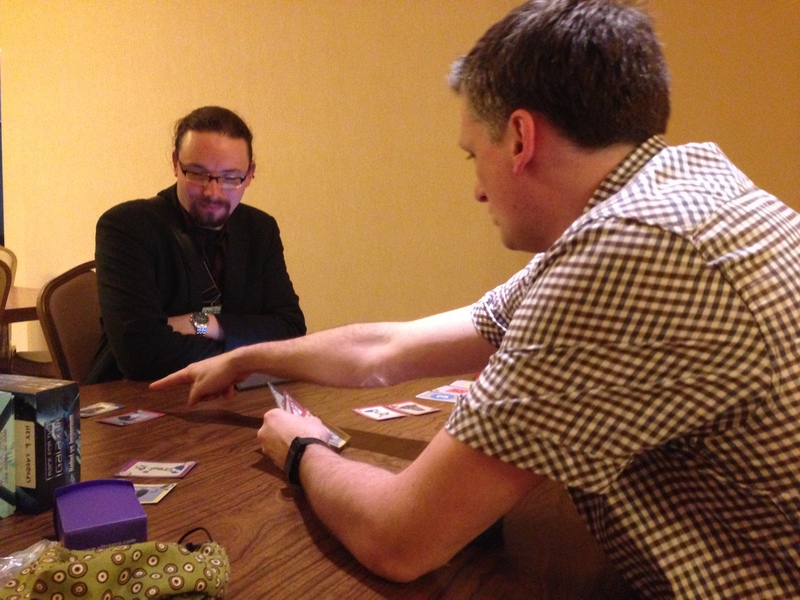 Below, we’re playtesting the revamped game with fellow Game Artisans of Canada colleagues, Martin Ethier and Al Leduc. 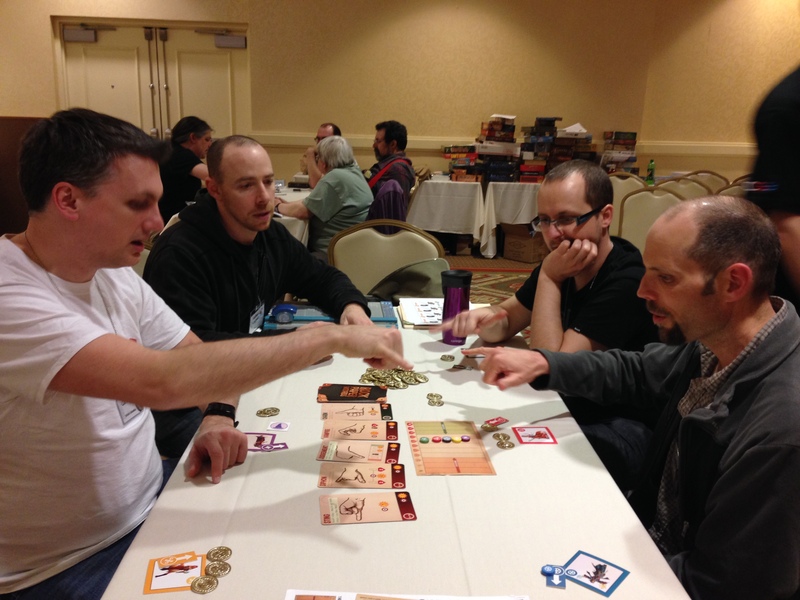 William Attia (designer of Caylus and Spyrium – and representative for Ystari Games) and Cyrille Daujean from Days of Wonder play my deduction game, Ignotus! Our second meeting was an impromptu meeting with Cyrille from Days of Wonder and William Attia (designer of Caylus and Spyrium) from Ystari. I knew William from last year, having played many games with him, and struck up a conversation with him and Cyrille. 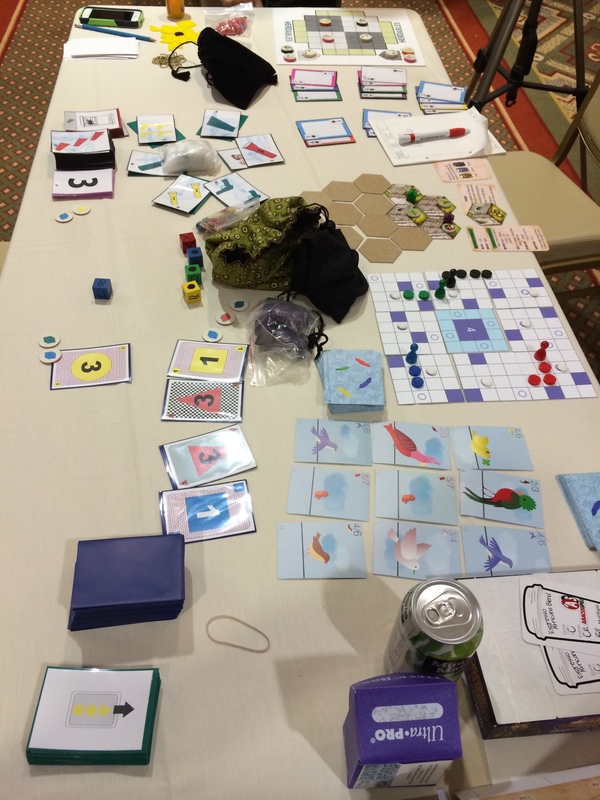 Even though I knew that none of our current games would really fit with either company, I asked if they were open to looking at some of our new prototypes. The event had just started and they weren’t busy so they decided to look at our new games! I was right – we didn’t have anything that fit with either company! 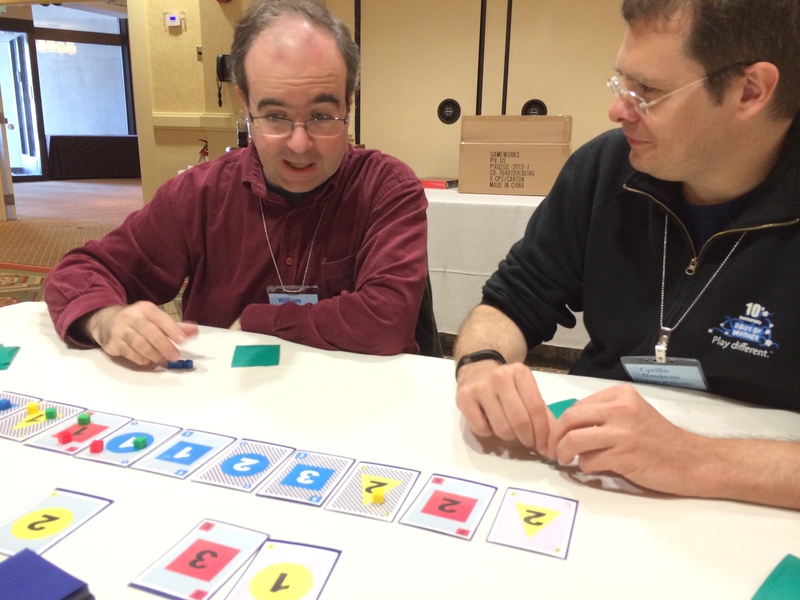 But that’s ok – they were really interested in a game I designed by myself – foolishly titled Ignotus (Latin for Unknown) – and they just wanted to play it because they liked deduction games. They both enjoyed playing it! Cyrille also gave us a contact at Blue Orange as he thinks our game called Herdables would fit well with them! How nice! A table full of prototypes waiting to be pitched! 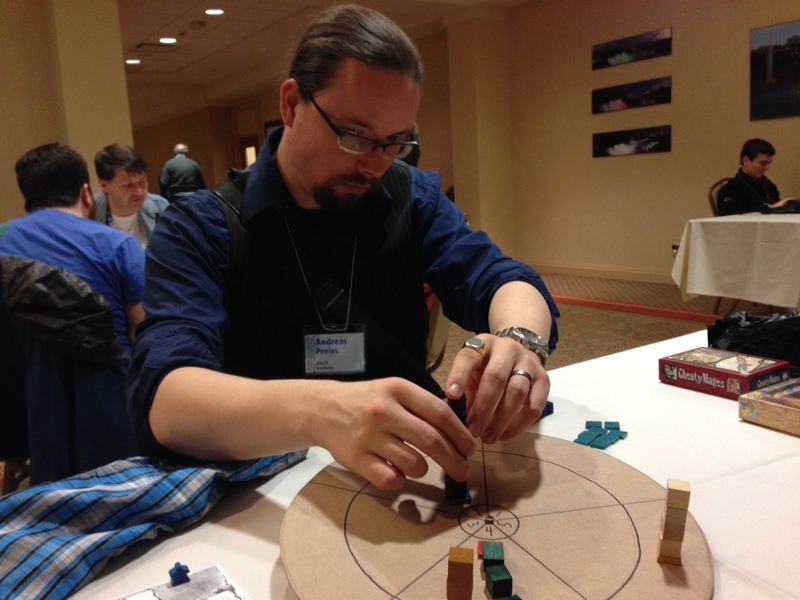 Every year I have pitched to Matthias from Abacusspiele and every year he has taken one of our games back with him, though they have yet to publish one of our games. Daryl Andrews, a fellow Game Artisan and myself set up a table full of the prototypes that we wanted to show off to him! I like Matthias and got to play a few ‘real’ games with him at the event throughout the week – including a really late game of Tichu one night – and he was happy to look at what we had to present this year. I showed him what we had and we played through a few rounds of Ignotus and Zombie Slam. He liked both of those and requested rules for each to be sent to him so he could assess them further. Yay – 3 for 3! We met up with Frank from R&R Games because he had a contract for us to sign for a game that we pitched to him last year called Pop Goes the Weasel. We had been negotiating it previous to the Gathering and so it was the perfect time for all of us to convene and sign multiple copies of the contract. He also let us know that they have been doing focus groups with it already and that they will most likely change the name of the game. Apparently the title makes parents think that the game is purely a kid’s game and not a family game. They’re not sure what the title will be yet – but they’ve also already replaced the mulberries with bananas! We’re pretty cool with these kind of changes since they’re based on a business decision that makes sense. This is another reason why it’s good to partner with publishers who have access to doing things like focus groups! We didn’t end up pitching any of our new games to Frank this year since he said his plate was now full of family and party games and that they were actually looking for more Euro style games – which we didn’t have this year. This was a nice surprise as we’ve never pitched to Zoch before! Zoch is a pretty big deal in Germany, especially with thei big hit Ghost Blitz. We knew we would have a game or two that Zoch might like! The Zoch representative, Andreas, ended up being a good friend throughout the Gathering. 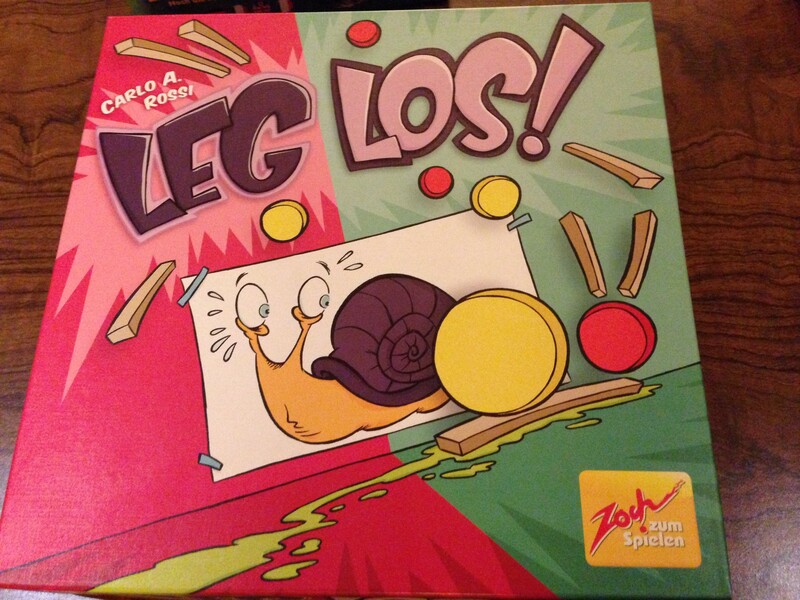 We played many games together – including some fun Zoch games like Polterfass and Leg Los! After pitching our games he expressed a lot of interest in Zombie Slam! He expressed some concern that Zoch wouldn’t do a zombie game though – especially if it had guns in it, but he really liked the mechanic. We chatted and found out that he probably could do it with ‘cute’ werewolves and no guns. That could work! Andreas mentioned that they were looking for a quick reaction game for next year so Zombie Slam might fit the bill. We also told him about our game Pig Goes Moo (previously called Ei-Ei-O! ), which we didn’t bring for some reason (d’oh!). He expressed interest in that one too and asked us to mail it to him asap. Next up we’ll regale tales of pitching to the likes of Huch & Friends, Toy Vault, Mercury, Hans Im Gluck, Think Fun, iEllo and Repos! Wow! And again, more pictures to complement Jay’s words! Ystari’s William Attia (who just celebrated a birthday – Bonne Fete!) and Cyrille Daujean (DoW) burn their brains to try to figure out what’s what in Jay’s solo effort, Ignotus. We return the favour by getting a convention exclusive playthrough of Five Tribes, the next Days of Wonder product, facing off against the designer himself, Bruno Cathala. Jay pitches our card game, Lions Share, to Andreas (Zoch). Fair is fair, so we learn how to play Polterfass aka “Rumbling Barrels”, a dicey betting game, from Zoch with Andreas and Jasmine (Hans im Glueck). One of our faves from the con! One of my personal favourites is a great drawing game where you use bits and pieces to create items for people to guess. The twist? You lose materials as you play, so you have less and less bits to draw the items with as you progress! I *slaughtered* everyone at this game. Andreas gave it to me to take home! Game recognizes game. 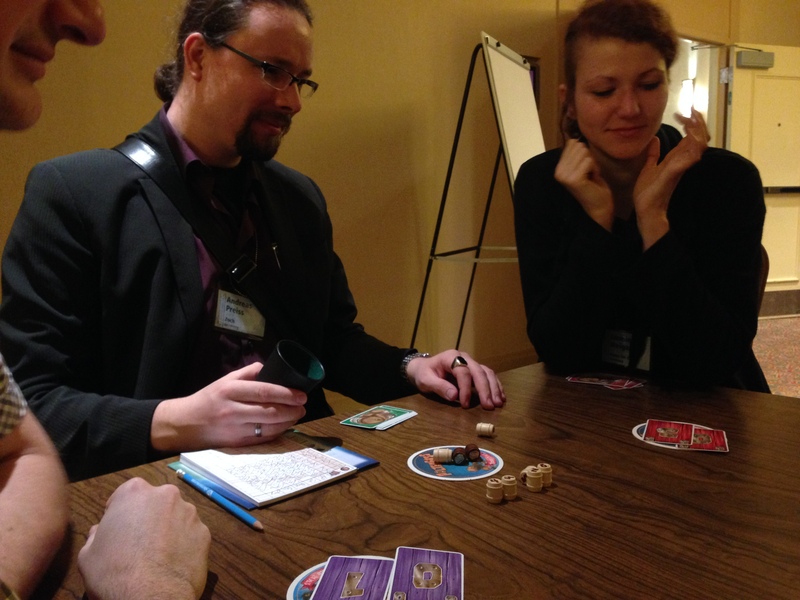 Later, we get Andreas to try out a game, Topsy Turvey Towers, from a fellow Game Artisan, Daniel Rocchi. 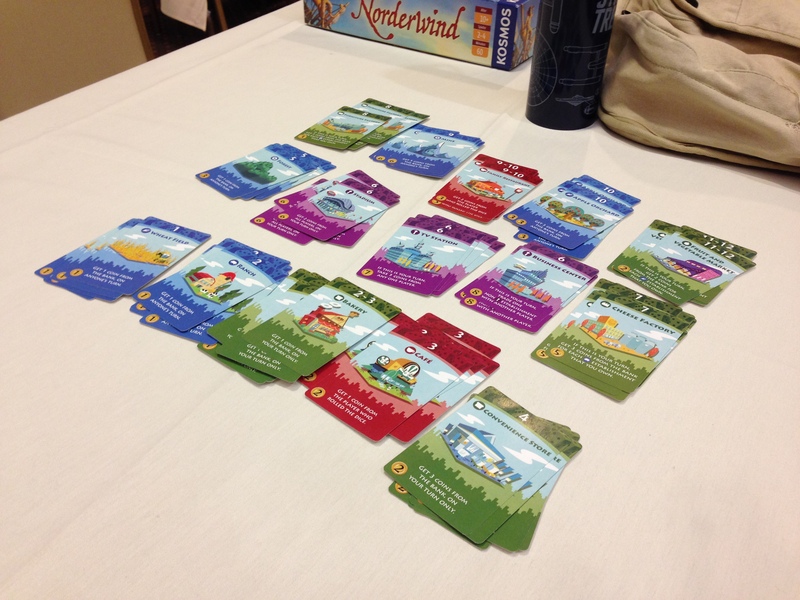 I also destroyed Andreas (not really) at Machi Koro, so this pic is just to commemorate my victory. Sen and I just got back from 10 days of gaming goodness and we have a lot of amazing news and stories to tell! What’s the Gathering you ask? Well it’s an invite-only event organized by Alan Moon (designer of numerous games including the very popular Ticket to Ride) and it’s attended by tons of other game designers and many publishers as well. The atmosphere was super relaxed and very friendly. Everyone has a name badge and based on the colour of the badge you know if the person is from a publisher or not. Fortunately this was my third time at the Gathering (read about my previous Gathering experiences for 2012 and 2013) so I already knew most of the publishers already. Sen and I got to meet with pretty much every publisher and show them our new games. I’ll review how each pitch session went in this post and a few more posts to follow! Our first meeting was with JF and Zev from Filosofia and Z-Man Games. 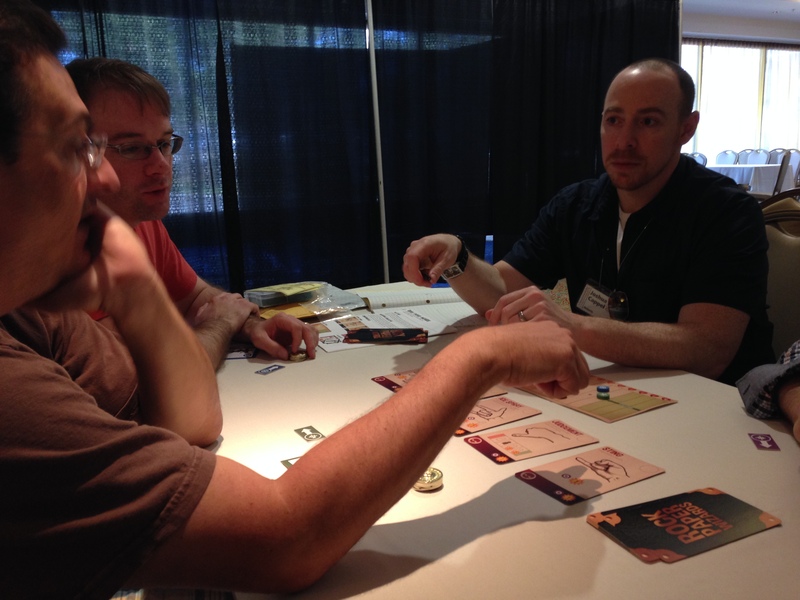 They had our game Rock, Paper, Wizards (co-designed by Josh Cappel too!) and had given us some feedback via email about some changes they wanted. This is an interesting story actually. Sen, Josh and myself had gotten Rock, Paper, Wizards to a place where we thought it was the best that it could be. So when we received the feedback via email about the changes they wanted, we all got pretty defensive. Not to the publisher – just between ourselves. We couldn’t understand why they wanted the changes they requested. But we decided to go into the meeting open minded – and even play the game with their new ideas – so they could see how it wouldn’t work! Well, we were pretty wrong! Once they were able to communicate the reasons behind their ideas in person, we realized what they were trying to do. So we tried it with almost all of their suggestions…and guess what? It really worked! 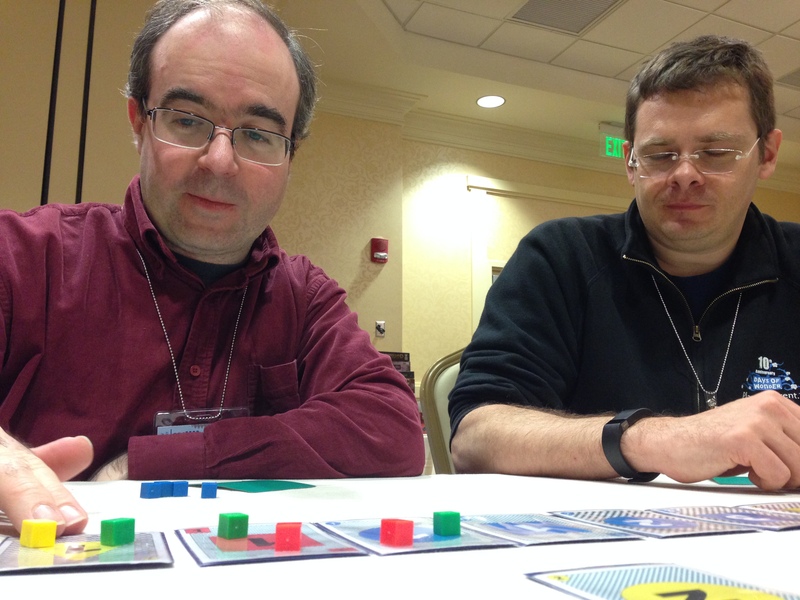 The game – which we thought was as good as it could get – was improved with these new ideas. The game played so well! We brainstormed how a few of the cards would be changed because of the new ideas and we said we would work on it while at the Gathering and show it to them again later on. After this, Zev left for another meeting and we pitched our new game, Zombie Slam to JF. He enjoyed it but didn’t think it was a Z-Man kind of game. Makes sense. We spent more time with JF and Zev eating dinner and even continuing our tradition of seeing a horror movie at a local theatre together (this year’s movie: Oculus!). We also got to sit down with Sophie from Filosofia because she had a contract for us! We had pitched our wood block balancing game, Junkyard to her awhile ago and she’s been trying to figure out how to produce the game. We had emailed her prior to the Gathering asking for the prototype back so we could pitch it to other publishers – even though we would be happy if Filosofia would publish it. She countered by offering us a contract! Well ok then! Nearer to the end of the Gathering, we made an appointment with Zev to try Rock, Paper, Wizards again. When we met up, he was finishing up a game with some other people and he asked us to come over and play Rock Paper Wizards with everyone at his table. Who was at his table? 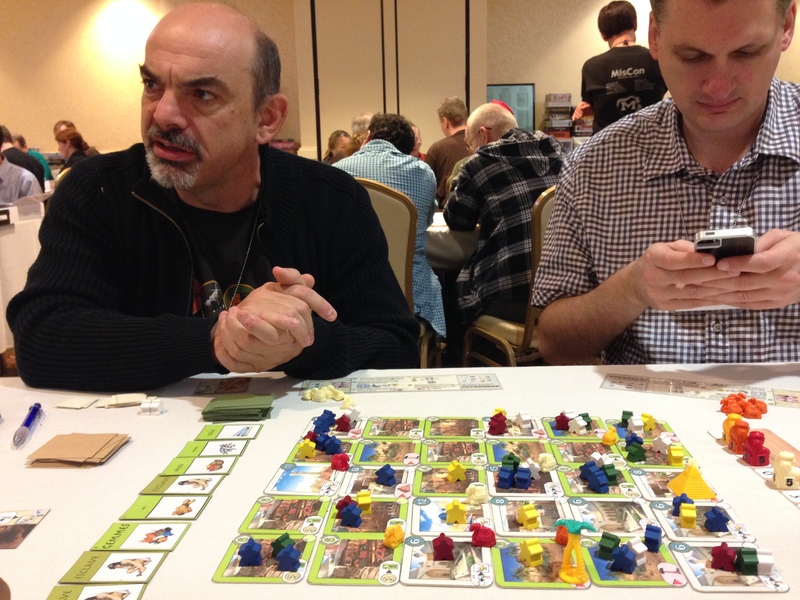 Well – Nikki from Queen Games, Aldie and Lincoln from Boardgamegeek and Steven from Stronghold Games. Wowza! No pressure! Well, we played the game and everything worked perfectly. Everyone was laughing and having a great time with it. So much so that Steven from Stronghold said out loud after finishing the game that if Zev didn’t want to publish the game that he would publish it! How cool is that? We have high hopes for this one! Next up we’ll review our pitches to Days of Wonder, Ystari, Abacusspiele and R&R Games! I’ll just add some more pictures to this post. You know. Because pictures. These ones are Z-man related and, as such, are relevant to this post! 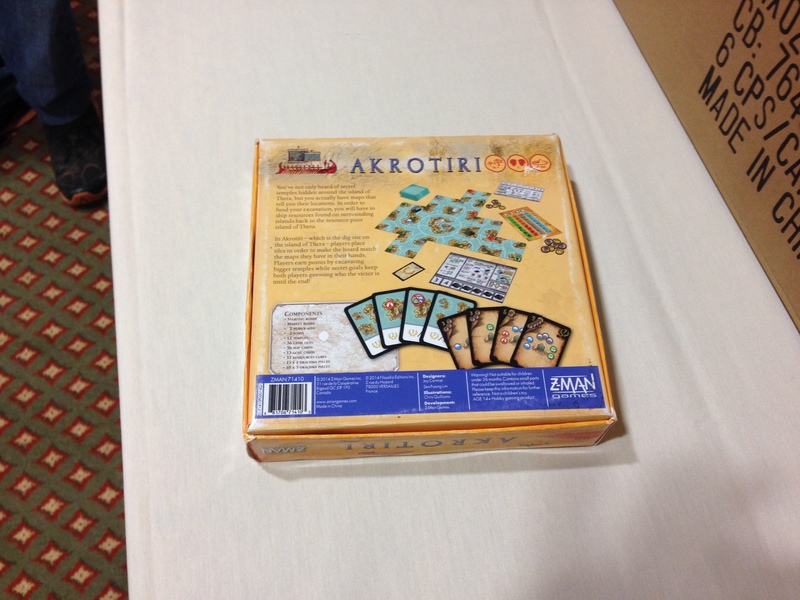 Jay’s first look at the back of the Akrotiri box, forthcoming from Z-man. And then he teaches it to fellow Game Artisans, Michael Xeureb and Gavan Brown (Jab). In other Z-man news, the Battle of Kemble’s Cascade is also coming out from them soon. 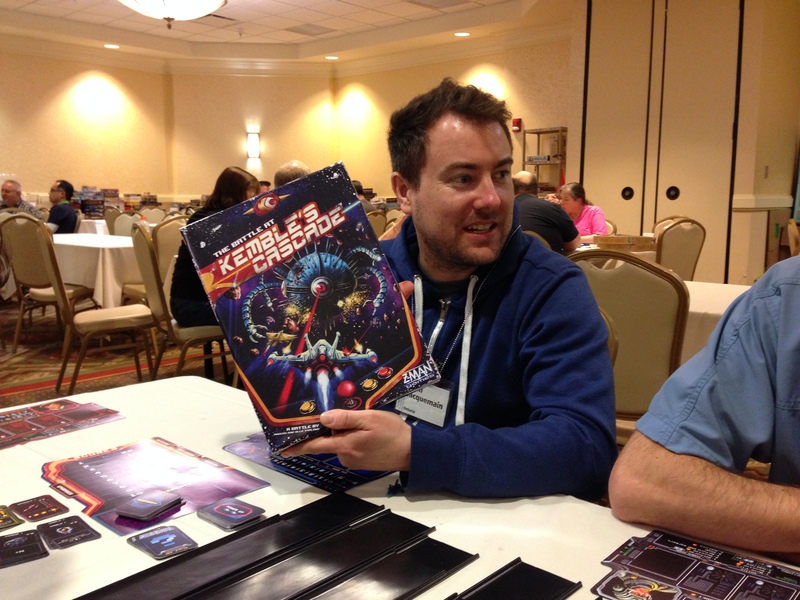 Our good friends, Sean Jacquemain, Adam Marostica, and I played the pre-release copy of this homage to 80s arcade games at the Gathering. 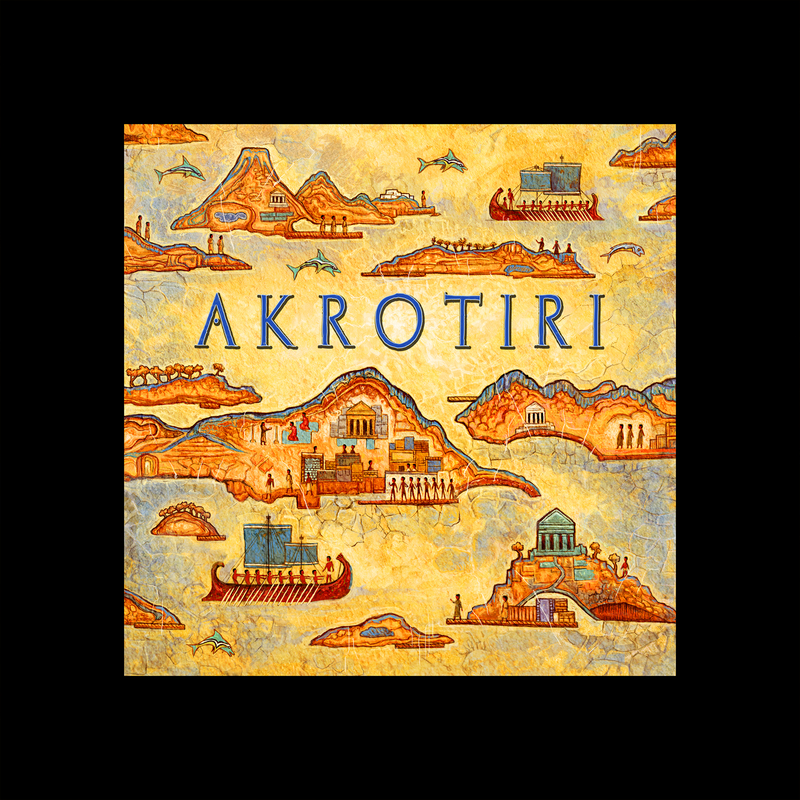 First review of our upcoming game Akrotiri! And it’s a good one! 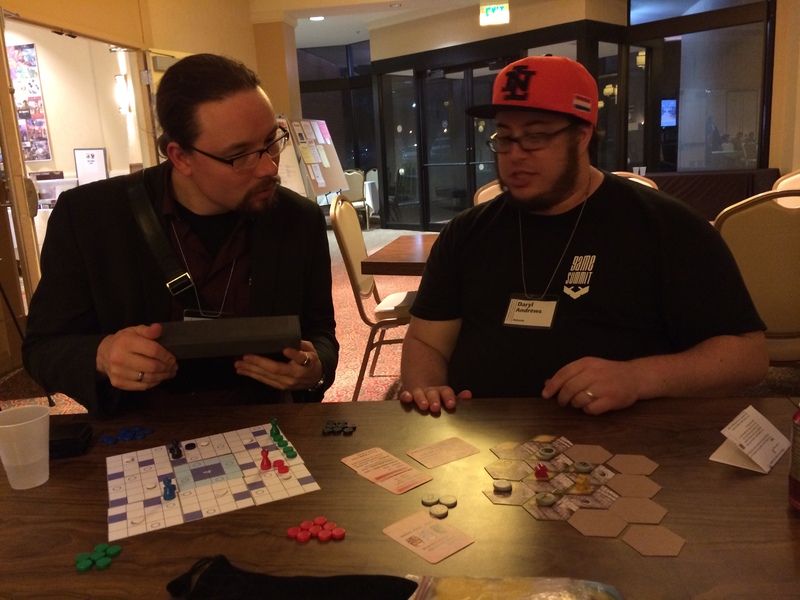 Adam from The Daily Worker Placement has given an overview and his thoughts on this 2-player Z-Man game from Sen and I. Adam got a chance to play the final art prototype at the Gathering of Friends. A final art prototype is when the publisher takes all the finished art and makes their own version of the game. They even print the box art image and tape it to another box to make it look complete. The only thing that’s usually not final are the components. In this game the temples are wooden houses (but they’ll look more like temples in the final version) and the boats were made out of erasers!! Good idea for a prototype actually! Other than that – the art is 100% final and it’s now being sent off to the printers. Thanks for the review Adam – can’t wait for you – and others – to get your hands on the final version later this year! 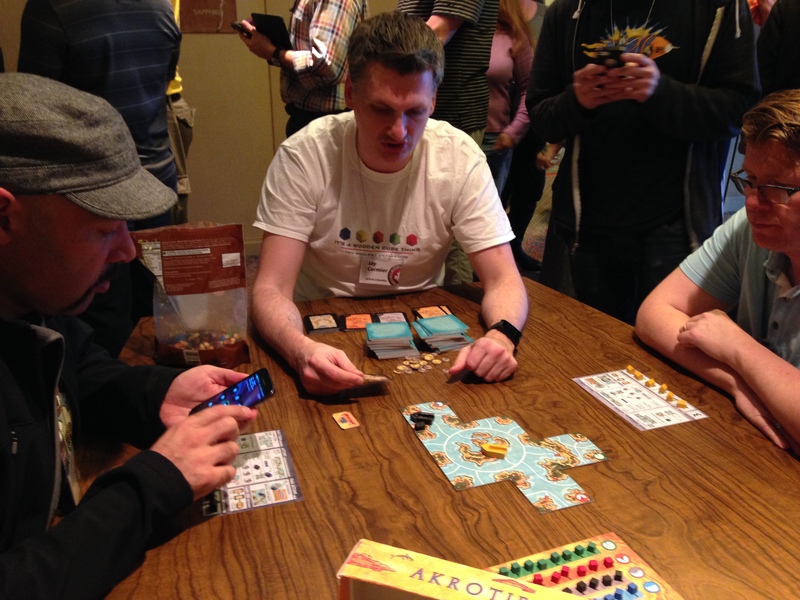 And here’s an interesting development: While we were at the Gathering of Friends – Akrotiri was being played by a bunch of people. One pair had a weird situation where the secret goal card one player picked up after excavating their 5th temple was already accomplished and was worth 13 points! Wow – that’s quite the swing of points so late in the game – though it’s very rare for it to be so dramatic like that. But still, we came up with a solution for those that want even less luck in their game. The main game will still remain as is, but for more advanced players they can flip 4 more Goal Cards face up near the board and any time a player has to take a Goal Card then they must take from one of the face-up Goal Cards. This means players can plan for specific goals and try to excavate easier temples in order to get the goal card they want faster! We added this to the main rule book – so it’s official now! 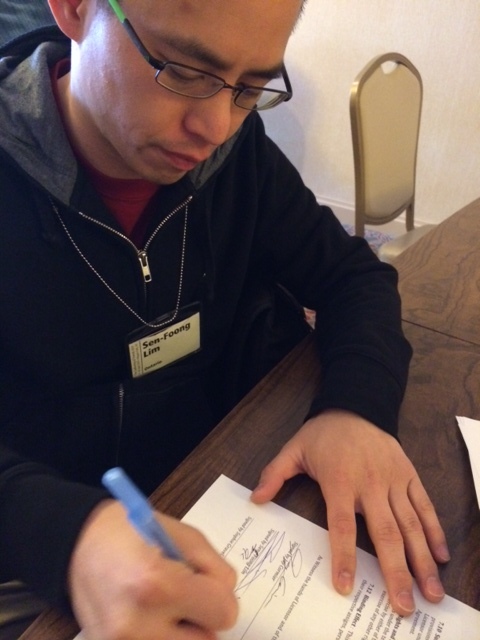 Three Board Game Contracts Signed! We signed three contracts last week! Woo hoo! 1. SimpliCITY signed by The Flux Capacity. 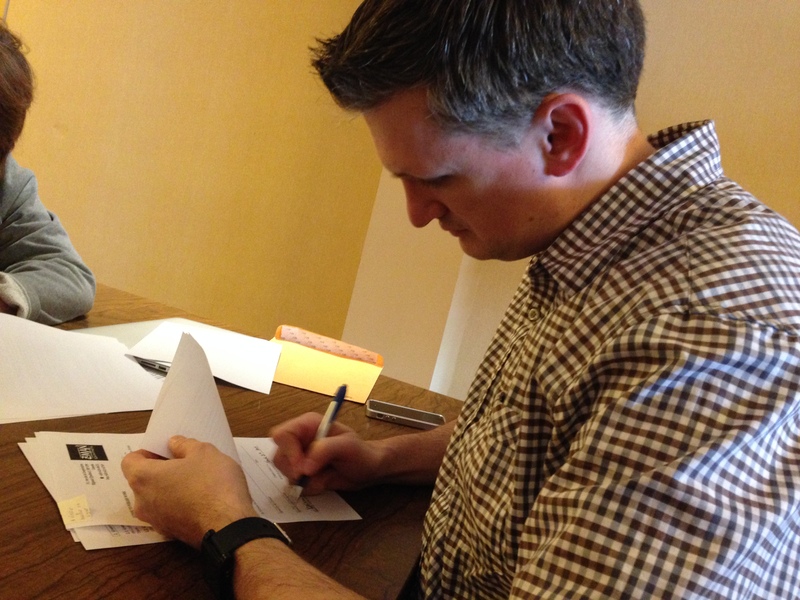 This one was unrelated to the Gathering, but we just happened to get the signed contract back! 2. Pop Goes the Weasel signed by R&R Games. 3. Junkyard signed by Filosofia. We’re over the moon at these three games getting signed! So much gaming goodness in each of them!! On top of this we pitched even more of our games to publishers at the Gathering – but I’ll update you all on that in the next post! We haven’t posted in awhile – mostly because the weeks leading up to Alan Moon’s Gathering of Friends is full of testing and prototype re-making! If you’re not familiar with the Gathering of Friends, then read this article here as it explains my experience from last year! Herdables: This is a Bejeweled type game in which you’re trying to get three animals of the same kind in a row. The nice twist to this one is that you must place your 2 animals each turn adjacent to a third animal – each of which is drawn at the end of your turn – which means you can always see how your opponent could play, and alter your move accordingly. A cool 2-player game! Firefly – With a Cool Subtitle: We were told by Toy Vault last year that they have the license for Firefly games and said they’d look at any Firefly games we pitched them. So we’re not ones to leave a request like that lying around! We came up with a really cool Advanced Incan Gold type of a game – where you have to escape back to Serenity before it’s too late. You don’t control any one character but instead are controlling the story of the characters as they go on missions to collect credits and battle the Alliance! Looking forward to seeing Toy Vault’s reaction to this one! Zombie Slam: Well some publishers have seen this one…kind of! We had a game called Jam Slam that has been to many publishers – but it was deemed too old for a kid’s game and too young-feeling for an adult game. So what do we do? Slap a zombie theme on it and make it a full on adult game! But in doing so we’ve found many more things to do with the game that align with the theme. What’s That? : This is a party game that uses an app! We partnered with Stefan Alexander to create the app, and then as a full partner in designing the game. It’s such a cool idea for a game! We showed it to Repos Production last year and they liked it – but we’ve never been happy enough with the app to send it to them…but we are now! I think this one will be exciting! On top of these three new games we have some others that have seen publishers before but haven’t been picked up yet. Not sure if there will be any new publishers there this year that haven’t seen these – but I might as well bring them! Chainables – a cool word making game with 2 decks of cards. 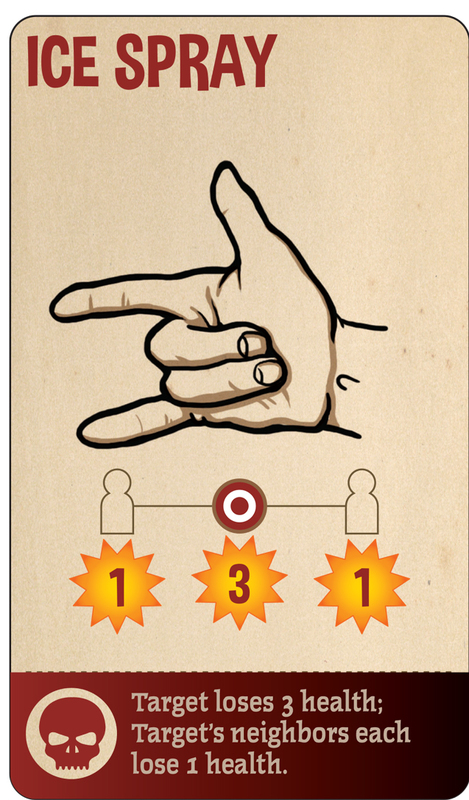 Lions Share – an interesting card game about sharing cards that you’ve won. EI-EI-O – almost got signed last year – but the publisher backed out when they saw another game coming out that had animals and sound effects in it (even though the games are different). Also I have partnered with another designer for the first time and we’ve got a really cool 3-dimensional tower building game called the Towers of Nakh. I love how it plays and it always draws a crowd because it looks so interesting while you’re playing it. Finally, I have my first solo project that I hope to have ready. It’s called Ignotus (which is latin for Unknown) and it’s about figuring out a player’s secret goal, which trying to achieve your own. So we’ll be busy again this year – but I mean that in a good way! 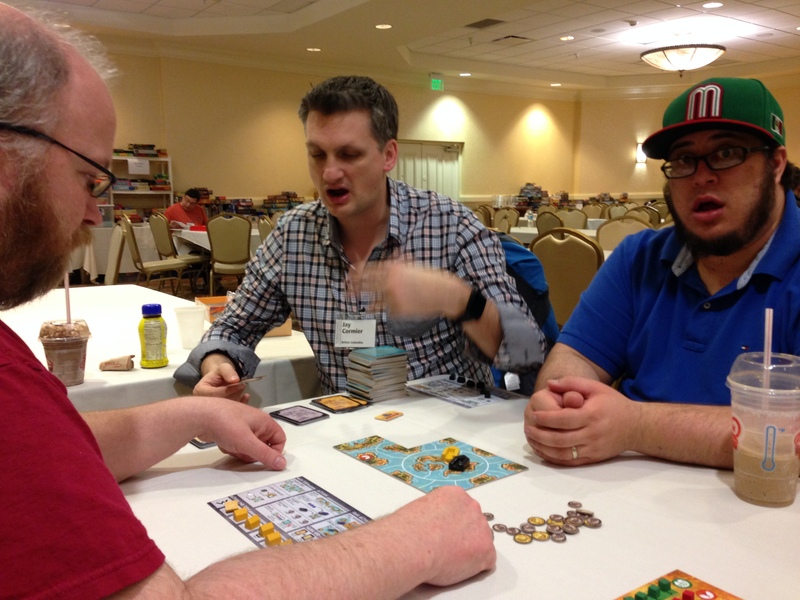 I love going to the Gathering and hanging out with other designers, playtesting their games and having them playtest our games – as well as meeting publishers in such a relaxed and casual way. I’ll post more after the event. Wish us luck! !